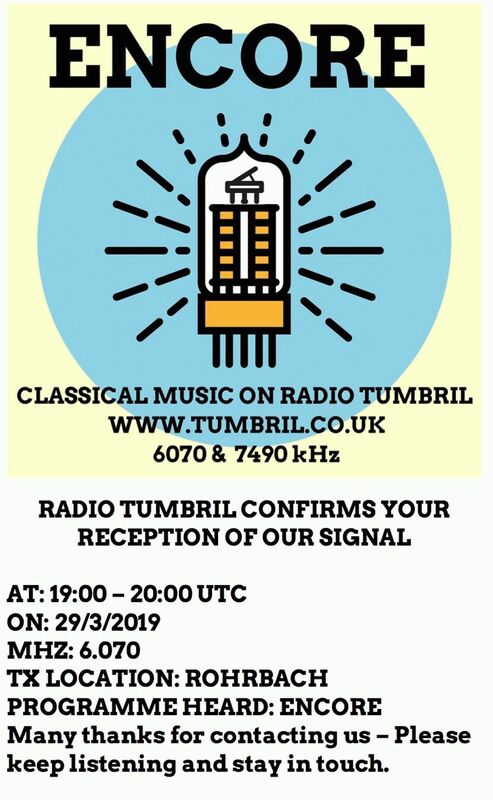 Получена первая для меня e-QSL от станции Radio Tumbril / Radio Encore Classical Music за прием трансляции через Channel 292 из Германии 29 марта 2019 года. Карточку в pdf файле от имени станции прислал Brice Avery. Thanks you very much for such a helpful and interesting reception report. And for the excellent pictures and video. Very interesting to see a part of Russia and the Volga. I will send you a QSL card sooon. The next Encore show will be transmitted on Sunday at 15:00 UTC. Here is your QSL card. I hope you enjoyed Sunday's TX - repeated on Friday at 19:00. If there is a piece of music or a composer you would like me to play do let me know. Brice Avery - Encore - Radio Tumbril.